Saltarelle Bois massif There are 8 products. 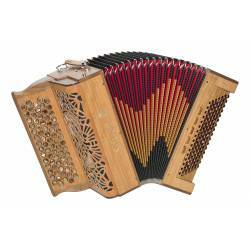 The Chaville is a professional quality, solid wood chromatic button accordion. Its super compact size makes it as lightweight as its top-of-the-range diatonic counterparts. 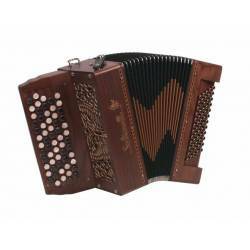 The Chaville is a top quality, solid wood accordion.Its super compact size makes it as lightweight as its top-of-the-range diatonic accordion counterparts. The Bourroche is a premium quality, solid wood accordion that offers the musical versatility of a 3-voice model, albeit in a super compact size. Its 84-bass left-hand makes a good compromise between 60-bass and 96-bass models. An unusual set-up that appeals to many accordionists. The Bourroche is a premium quality, solid wood accordion that offers the musical versatility of a 3-voice model, albeit in a super compact size. Weighing no more than its top-range diatonic counterpart, thanks to its super-compact design. 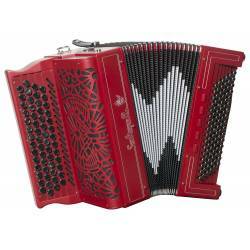 Boasting 84 basses and 5 rows, this accordion is remarkably versatile for its size! An engineering feat by Saltarelle! 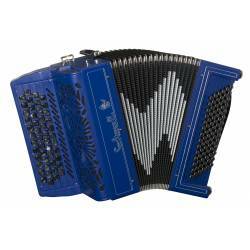 The Saltarelle Agapanthe undoubtedly stands as the top innovation of the year in the world of “musette” accordions. The Agapanthe is a marvellous combination of tradition and modernity. 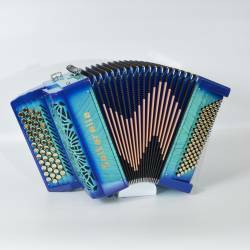 It will seduce musette fans who favour a very lightweight accordion and will leave them baffled by its breathtaking dynamics! 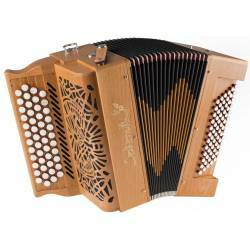 The Arcadia is a top-quality solid wood accordion that offers the musical versatility of a 3-voice/96-bass model. 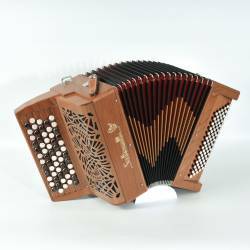 Measuring only 36 cm (14 inches) when played, this accordion is smaller than the 2-voice/80-bass average, and is yet another remarkable feat of engineering by Saltarelle. 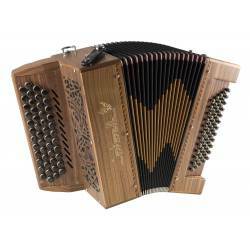 The Artefact is a top-of-the-range accordion crafted in solid wood with a unique and meticulous finish.Measuring only 36 cm in height, this accordion is smaller than the 80-bass/2-voice average, a great technical feat by Saltarelle.